Great blog name! Great ideas! This is such a cute stamp! Great card. So simple but so cute! So cute! I only decorate my envelopes with images this large when I'm hand delivering. I didn't know you could mail them too! Great idea for the envelopes; so cute! Thanks for sharing! One thing I love about Unity Stamps, is that you can create simple or detailed cards and they always look fantastic. Thanks for sharing! I just love that little snail! I got to start stamping on envelopes. makes them oh so adorable to send out!! I lOVE see all the different ways you ladies are coloring and the techniques being used on this Snail Mail set. I really want to decorate my envelopes with this set since it is so perfect for it. Thanks for sharing. Love the SnailMail stamp. Cute! Cute idea. I never think to decorate my envelopes. Love this set, it's on my wishlist. Cute card! Thx for the ideas!! Love your stamped envelopes Maureen! I've always used sentiment type stamps on my envelopes but this opens a whole new world for decorating them! Great idea. I love the envelopes and can see how much easier the Misti makes it. Love the idea of decorating the envelope as well! These would have many great uses and so adorable. Oh I just love that little snail. Thank you! Love this Unity stamp. Love my Misti. Super fun Blog hop today. I love this, so cute. Hi Maureen, yes I hear that the MISTI makes them really fast and easy to create. I have been wanting one for some time now. I will leave hints for my upcoming August birthday! smile! The snail mail stamp set is adorable!! Brilliant idea! This image is perfect for it! Love the idea of decorated envelopes! I have stamped a portion of the envelope but never considered coloring. Will the post office still mail if the envelope is covered this much? I think I will give it a try. Thanks for sharing! Your envelopes are just darling! Thanks so much for sharing! Oh my gosh!! So cute!!! misti has definitely changed the world of stamping!! This is such a great idea Maureen. I love YOUR envelopes, how much fun would it be to receive one of these??? ♥ it! Fun idea. Thanks for sharing. i might even be convinced to decorate envelopes using my MISTI tool. I see it is the latest trend. Great idea. Love those envelopes. Love your set of envelopes! Simple projects are the best. 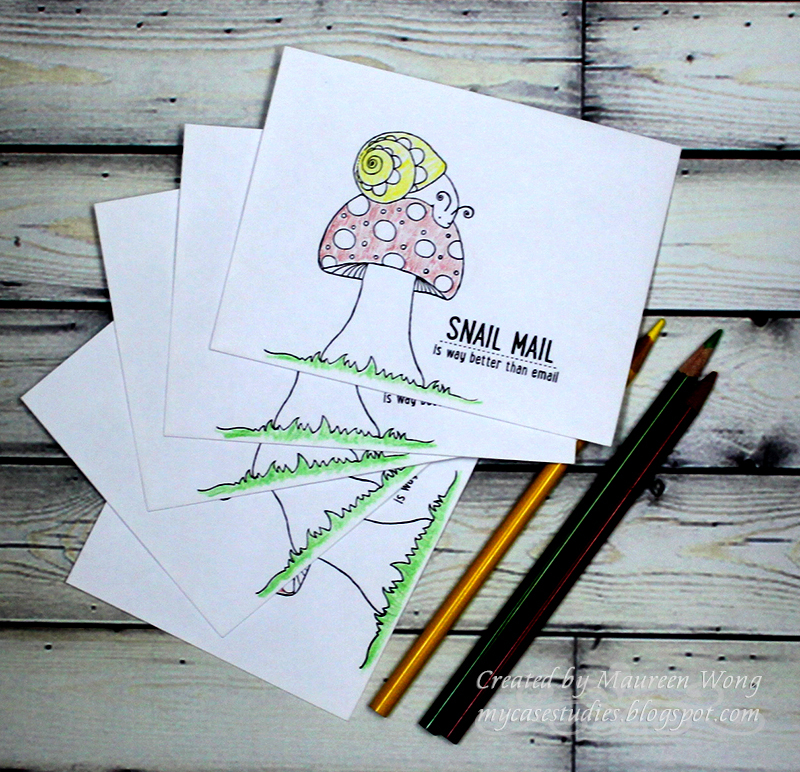 Cute snail mail envelopes. I like your coloring. I love your beautiful creations. I've been trying to incorporate envelope art too! That's why I am going to have to buy a Misti for positioning. I get so grumpy when I ruin a whole envelope by adding a crooked image or sentiment! What a great idea! Cute. So cute! I always forget about decorating the envelope. Who doesn't fall in love with this guy? Love your design! I love decorating my envys and I just ordered this set yesterday to do just that! Thanks. Great idea ! Thank you for sharing. Any one would love to get this little snail in the mail. I haven't thought to precolor envelopes. What a great idea! These are so CUTE. Lovely stamping. Oops, I think I deleted my comment. I was saying that this is such a brilliant idea to decorate the envelope and ramp it up to classy. Thank you, Maureen. Perfect image for an envelope - great idea and so well done. Love this stamp. So cute! Too cute, everyone loves this little guy. I want the snail set but was curious too if we could mail them with the sentiment on the front? Love the envelope idea! I will be doing this soon! So cute - love that snail mail! The MISTI makes it a dream to create Multiples! So cute! This is really cute! I love the look with the minimal color! Cool technique! Cute idea! 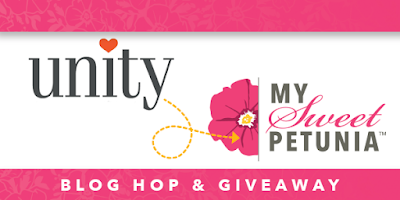 Fun blog hop! I'm making note cards right now - and yes they are fast! Loved your cards... and love the MISTI! Unity stamps is new to me. This hop maybe dangerous. I already have two things on my wishlist! Love the Unity stamps, they are so cute. How clever of you to use them on an envelope. Thanks for sharing!